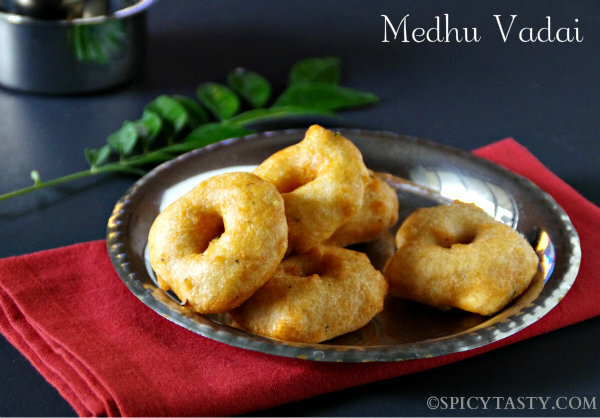 Medhu Vadai or Vada is a traditional South Indian food. They are crispy outside, soft and airy inside. Generally served with sambar and chutney as a side or dunked in a yogurt sauce or sambar or rasam and served as dahi vada (curd vada), sambar vada and rasam vada respectively . 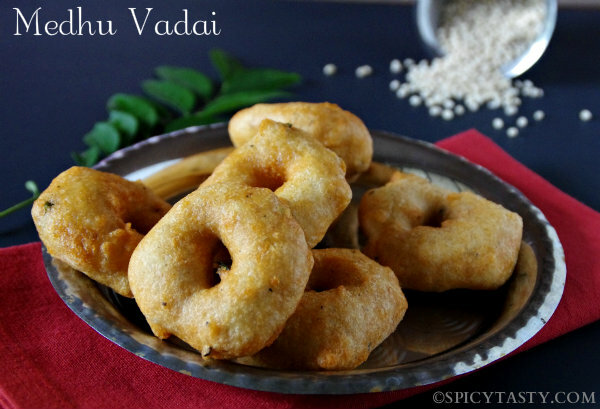 Vada is generally served with Ven Pongal and idli which completes a typical South Indian breakfast. The main ingredient of this dish is whole urad dal, black gram without skin which is very nutritious. Vadas are preferably eaten freshly fried. It is one of the common food you can find in street carts as well as in restaurants. It makes me nostalgic when I think about those days when we used to buy vada and bajji from street vendors. I still continue to enjoy it whenever I visit India. Nothing can beat that taste. Wash and soak urad dal in water for half an hour. 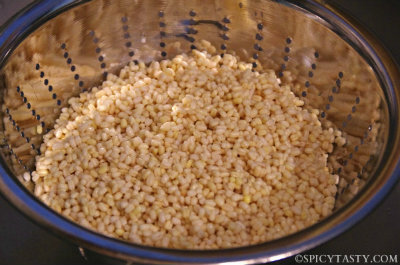 After an hour, strain urad dal in a colander and let it rest for 10 minutes. Reserve the water for grinding. Grind urad dal along with chopped green chillies, ginger, salt and sprinkle water little by little and grind it until smooth. 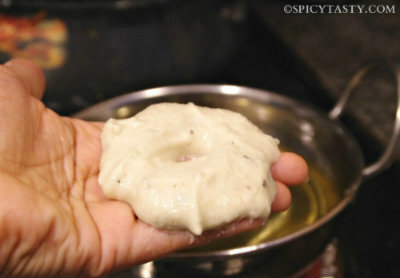 Make sure you don’t add more water, cause the vada will absorb more oil in that case. 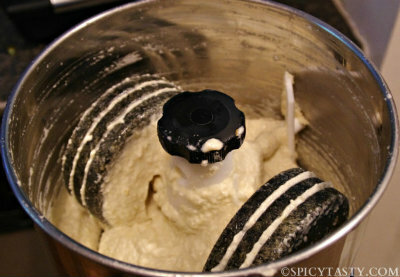 Once batter grinds to a smooth paste, turn off the grinder and transfer it to a bowl. 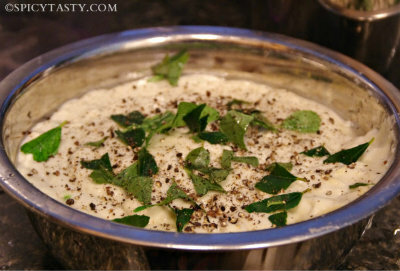 Add coarsely ground black pepper, curry leaves and 1/2 tsp of finely chopped ginger and mix well. Heat oil in a deep bottomed pan or kadai a little over medium heat or medium high heat. If you cook on high heat only the outside will be cooked and the inside will be sticky. Repeat the procedure with the rest of the batter frying 4 to 5 vadas at a time depending on the size of your pan. Give a 2 minutes gap between each batch for the oil to become hot. Turn both sides and cook until vada becomes golden brown. Remove from oil and put it on a bowl lined with paper towel. Concentrate on the consistency of the batter. 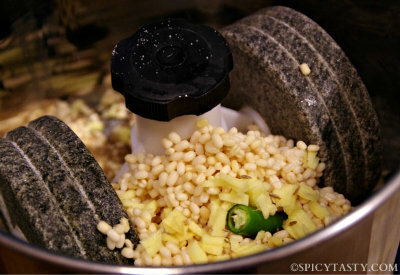 You can grind the batter in wet grinder or mixer grinder or food processor. I always prefer wet grinder since the batter is fluffy and therefore perfect. Follow the procedure to dot especially points like sprinkling water and not pouring. Shape comes with practice. If you don’t get the shape then just drop small amount of batter with a spoon or use your hand. Who needs shape when it tastes awesome!! Check out the other type of vada made with chana dal (split chickpea) called masala vada. Tip: If you are in a hurry you can soak urad dal in hot warm water for half an hour in a hot pack or in a closed container. I LOVE these!! I don’t think I could stop at just one. Delicious vadais. They are my all time favourite breakfast items. crunchy , tasty and so delicious! Lovely cake and perfect colours. Happy Independence Day! I think there is a typo for the number hours the urad dal has to be soaked in water. In the first line you have said ‘half an hour’ . But next you have said ‘After an hour’. I guess the first line needs to be ‘one hour’. Godd recipe and hints btw. Wonderful clicks………..
Hi Gita, Thanks for pointing it out. Yes it is typo and now I have updated. Thanks again for your comments. Hey tried it out today…the taste was perfect however when I tried to transfer from one hand to other it did not work…so had to use a small karandi to get small rounds…can u advise me the exact consistency…how do I know its the right batter consistency…shd it be like idly batter or any eg to relate to batter? Pls my husband loves vada and I so want to get the desired doughnut shape. U can assist by sending tips to emailsudha@gmail.com. I love ur site…makes cooking real fun. Tip: You can soak urad dal in hot water for half an hour in a hot pack if you are in a hurry. i really dont think that the above mentioned point works. 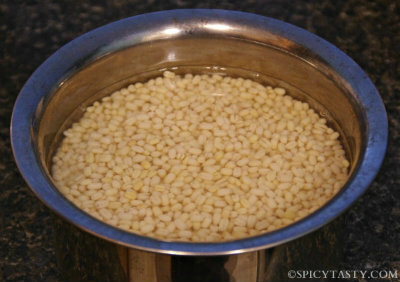 Urad dal gets half cooked, if soaked urad in hot water in a hot pack. I couldnt make a soft batter out of those urad dal. Could you please let me, where i would have made mistake? Water shouldn’t be too hot. Try soaking it in warm water.